As defined by the American Heart Association: Ischemia (is-KE’me-ah) is a condition in which the blood flow (and thus oxygen) is restricted to a part of the body. Cardiac ischemia is the name for lack of blood flow and oxygen to the heart muscle. Ischemia is the term given to heart problems caused by narrowed heart arteries. When arteries are narrowed, less blood and oxygen reaches the heart muscle. 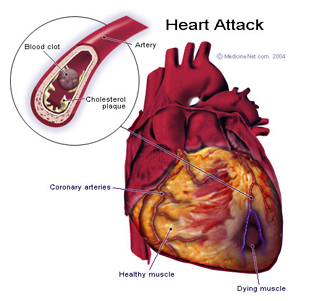 This is also called coronary artery disease, (CAD) and coronary heart disease. This can ultimately lead to heart attack. Ischemia often causes chest pain or discomfort known as angina pectoris (AN’jih-nah or an-JI’nah PEK’tor-is). The American Heart Association estimates as many as 3 to 4 million Americans may have ischemic episodes without knowing it. These people have ischemia without pain — silent ischemia. They may have a heart attack with no prior warning. Carotid IMT testing using HeartSmart IMTplus technology has been proven to identify the extent of the restriction and the types of plaques causing the obstruction in asymptomatic and symptomatic patients.